Balmoral Resources Ltd. ("Balmoral" or the "Company") (TSX: BAR) (OTCQX: BALMF) today announced that on-going expansion drilling has successfully extended the vertical depth of the core of the H3 Ni-Cu-PGE Zone by over 30%. 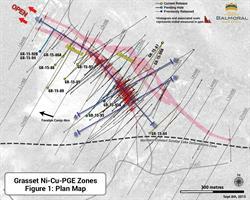 Two holes, GR-15-87 and GR-15-90a (see Figure 1 and Figure 2), drilled along the projected plunge of the H3 Zone intersected nickel sulphide mineralization over down hole widths of 118.84 and 86.09 metres respectively. Both holes extend the higher-grade core of the Zone vertically by approximately 100 metres in the areas tested (see Figure 3 and Figure 4). Results from the two holes were highlighted by an intercept of 42.70 metres grading 1.11% Ni, 0.12% Cu, 0.20 g/t Pt and 0.49 g/t Pd, within a broader 118.84 metre wide sulphide mineralized intercept which returned 0.67% Ni, 0.07% Cu, 0.11 g/t Pt and 0.27 g/t Pd from hole GR-15-87. This is one of the top six intercepts reported to date from the H3 Zone on a grade x thickness basis. Both GR-15-87 and GR-15-90a show mineralized widths roughly equal to, and grades notably stronger than, the two holes located vertically above them (see Figures 3 and 4). This suggests a trend back toward higher nickel, copper, platinum and palladium grades at depth within the core of the larger system. 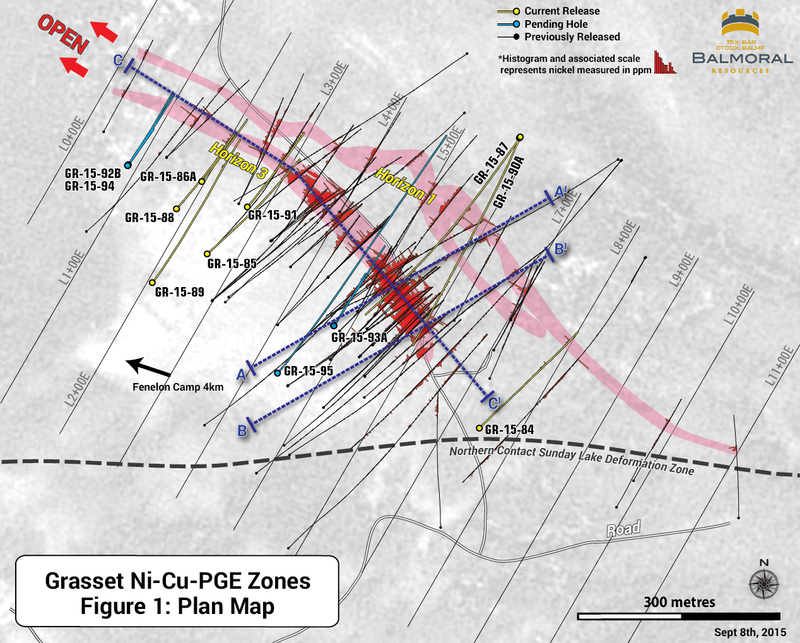 "Today's results represent a significant expansion of the higher grade core of the H3 Zone and clearly demonstrate that the Zone remains open for further expansion to depth, with the potential added bonus of improving nickel grades," said Darin Wagner, President and CEO of Balmoral. "With these strong results from H3, several additional mineralized intercepts from the nearby H1 Zone and continued confirmation of high-grade gold potential proximal to the Grasset discoveries our team continues to deliver an expanding suite of growth opportunities." including 353.14 354.31 1.17 1.00 0.18 0.20 0.46 "
including 345.20 348.52 3.32 1.20 0.15 0.31 0.83 "
including 145.81 156.53 10.72 0.52 0.06 Pending "
which includes 154.63 155.11 0.48 1.98 0.38 Pending "
including 249.94 250.33 0.39 2.34 0.49 1.37 2.57 "
including 453.46 539.00 85.54 0.82 0.09 0.14 0.34 "
which includes 477.46 520.16 42.70 1.11 0.12 0.20 0.49 "
and 534.95 539.00 4.05 1.78 0.19 0.36 0.91 "
including 229.57 230.27 0.70 1.19 0.13 0.27 0.71 "
including 249.00 249.59 0.59 3.02 0.12 0.13 0.62 "
and 250.91 251.80 0.89 0.65 0.43 2.42 2.43 "
including 537.28 543.40 6.12 1.28 0.12 0.30 0.59 "
which includes 537.28 538.50 1.22 3.33 0.40 0.75 1.64 "
and including 562.29 584.91 22.62 0.98 0.10 0.16 0.41 "
which includes 576.07 584.91 8.84 1.22 0.13 0.21 0.52 "
including 161.02 163.26 2.24 0.72 0.07 0.16 0.36 "
* Consistent with previous releases all intercepts reported are down hole lengths, not true thicknesses. Insufficient modelling has been completed to date to define the orientation of the most recent mineralized intercepts in space; true thicknesses are anticipated to range from 50 and 80% of down-hole lengths. Infill drilling on the northwestern portion of the H3 Zone returned mineralized intercepts consistent with previous drilling in this area. Results continue to indicate that the mineralized system remains open to depth, and to the northwest, along both Horizons 1 and 3 (H1 and H3). The initially planned infill drilling of the H3 Zone has now been completed. Expansion drilling continues to depth and additional holes will likely be added to infill the recent expanded portions of the H3 Zone. Testing of H1 during the current program continues to show local areas of higher grade nickel mineralization, including 5.67 m grading 0.99% Ni in GR-15-90a, providing potential to include portions of the H1 Zone in the planned initial resource estimate. Two drills continue to turn on the Grasset Property. 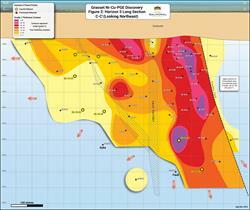 Drilling is anticipated to continue through the month of September. 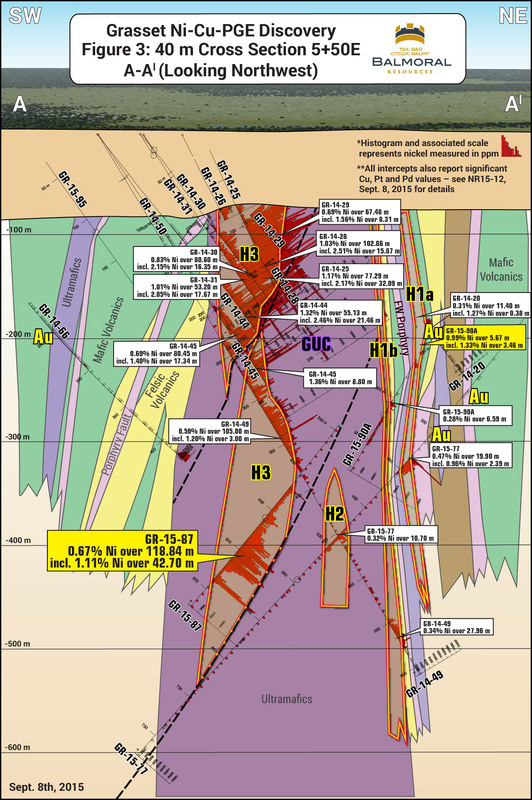 One drill is current dedicated to the depth extension of the H3 and H1 Ni-Cu-PGE Zones. The second drill will predominantly focus on exploration targets along the projected trend of the Grasset Ultramafic Complex ("GUC") and elsewhere on the Grasset and adjacent properties. 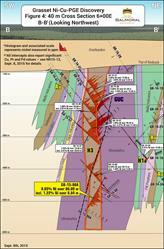 The Company has recently completed staking of 19 additional claims in the Lac Grasset area. The summer/fall 2015 program remains on, or slightly under, budget. To date three areas of anomalous gold mineralization have been identified proximal to the H3 and H1 nickel discoveries. Two of these occur in strongly deformed volcanic rocks located in the hanging wall to the GUC. These two occurrences, located approximately 300 metre apart, typically exhibit abundant quartz-carbonate veining, carbonate wall rock alteration and limited sulphide mineralization. They appear to have WNW trends and steep dips; crudely parallel to the regional Sunday Lake Deformation Zone in this area. Holes GR-15-88 and GR-15-89 intersected the northern of these two trends with GR-15-89 returning a high grade intercept of 9.33 g/t gold over 3.80 metres. This intercept may correlate with similar high-grade intercepts located 150 metres to the east in the GR-14-50 series of holes. Additional testing appears to be warranted in this area to determine the extent of the high-grade gold mineralization. 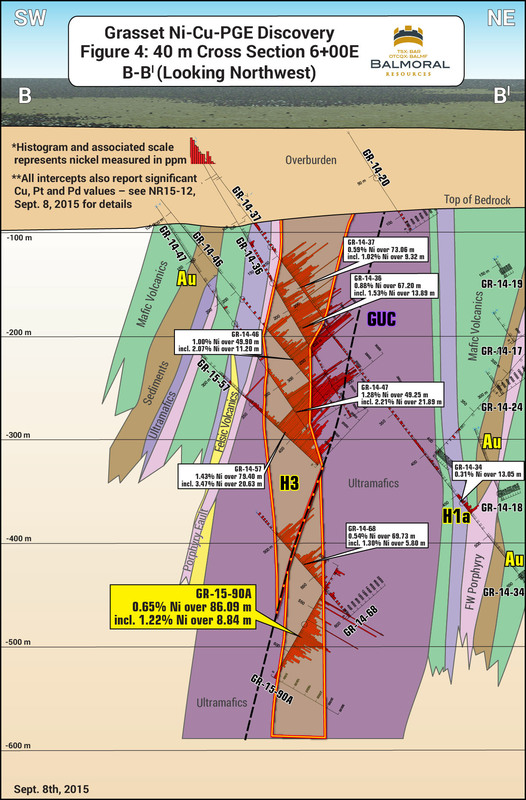 The third area of anomalous gold mineralization occurs in the footwall to the GUC, to the northeast of and proximal to a portion of the H1 Zone. Here several holes, including GR-15-90a, have intersected a moderately broad zone of massive to semi-massive, potentially stratabound, semi-massive to massive pyrite mineralization which is consistently associated with anomalous gold mineralization. 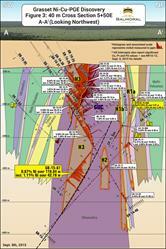 Deeper testing of the H3 Nickel Zone will provide an opportunity to further evaluate the gold potential of this area. The Company also announced that it has completed a major update of its website -- www.balmoralresources.com -- which will provide a greater breadth of information in a more mobile friendly format. Additional content will be forthcoming over the weeks ahead. Shareholders are urged to visit the site and provide their ideas on how to continue to enhance the website and the Company's communications. Mr. Darin Wagner (P.Geo. ), President and CEO of the Company, is the non-independent qualified person for the technical disclosure contained in this news release. Mr. Wagner has supervised the work programs on the Grasset Property, visited the property on multiple occasions, examined the drill core and/or photographs from the holes summarized in this release, reviewed the results with senior on-site geological staff and reviewed the available analytical and quality control results. Balmoral is a Canadian-based discovery company focused on the delineation of high-grade gold and nickel-copper-PGE discoveries on its wholly owned, 700+ square kilometre Detour Trend Project in Quebec, Canada. With a philosophy of creating value through the drill bit and a focus on proven productive precious/base metal belts, Balmoral is following an established formula with a goal of maximizing shareholder value through discovery and definition of high-grade, Canadian base metal and gold assets. This press release contains forward-looking statements and forward-looking information (collectively, "forward looking statements") within the meaning of applicable Canadian and United States securities laws. All statements, other than statements of historical fact, included herein, including statements regarding the anticipated content, commencement, duration and cost of exploration programs, anticipated exploration program results, the discovery and delineation of mineral deposits/resources/reserves, the timing of the receipt of assay results, the potential to expand the high-grade core of the Grasset H1 and H3 Zones and business and financing plans and trends, are forward-looking statements. Forward-looking statements are typically identified by words such as: believe, expect, anticipate, intend, estimate, postulate and similar expressions or are those which, by their nature, refer to future events. Although the Company believes that such statements are reasonable, there can be no assurance that such statements will prove to be accurate, and actual results and future events could differ materially from those anticipated in such statements. The Company cautions investors that any forward-looking statements by the Company are not guarantees of future performance, and that actual results may differ materially from those in forward-looking statements. Important factors that could cause actual events and results to differ materially from the Company's expectations include those related to weather, equipment and staff availability; performance of third parties; risks related to the exploration stage of the Company's projects; market fluctuations in prices for securities of exploration stage companies and in commodity prices; and uncertainties about the availability of additional financing; risks related to the Company's ability to identify one or more economic deposits on the properties, and variations in the nature, quality and quantity of any mineral deposits that may be located on the properties; risks related to the Company's ability to obtain any necessary permits, consents or authorizations required for its activities on the properties; and risks related to the Company's ability to produce minerals from the properties successfully or profitably. Trading in the securities of the Company should be considered highly speculative.All of the Company's public disclosure filings may be accessed via www.sedar.com and readers are urged to review these materials, including the latest technical reports filed with respect to the Company's mineral properties.